NextOn my stereo this week: ‘Homemade Dynamite’ by Lorde. Yes, a first time viewer might honestly feel a little lost. I think I’ve watched The Big Sleep at least once a year for some twenty years and I’m still left to wonder how it all fits together because while the film’s star Humphrey Bogart, as private eye Philip Marlowe, manages to tie up the loose ends in his original investigation of the blackmailing Carmen Sherwood, other plot points and concerns are left open-ended. The famous plot point of who killed Owen Taylor, the chauffeur in the film who was fished out of the harbour for instance always comes to mind. Lauren Bacall goes on to point out that The Big Sleep was also in essence ‘a whodunit’s whodunit’ kind of picture. And maybe that’s the whole point of the film to keep us guessing. Yet despite the confusion (and please bare with me here) in regards to Owen Taylor’s killer, we can safely surmise that Talyor’s killer [spoiler ahead] was likely another blackmailer called Joe Brody. Then again, Brody never actually admits to killing Taylor, even when under duress by Marlowe character assassination of him. At best, Brody admits to knocking him unconscious, which still leaves some reasonable doubt about Taylor’s death. That said, there is no point trying to explain this further, you’ll have to make up your own mind by watching the film. But if you will allow me to make one last point on The Big Sleep ‘devious plotting’, it was I believe designed not by accident but deliberately with a dual purpose in mind. It is the second half of the film, where you really have to start paying attention, after Carmen’s blackmailing situation is resolved, that the film dives deep into unraveling the deeper mystery of the film, which concerns Lauren Bacall’s character Vivian and her allegiance to her family, the lowlife crooks in her life and her relationship with Marlowe (Bogart). 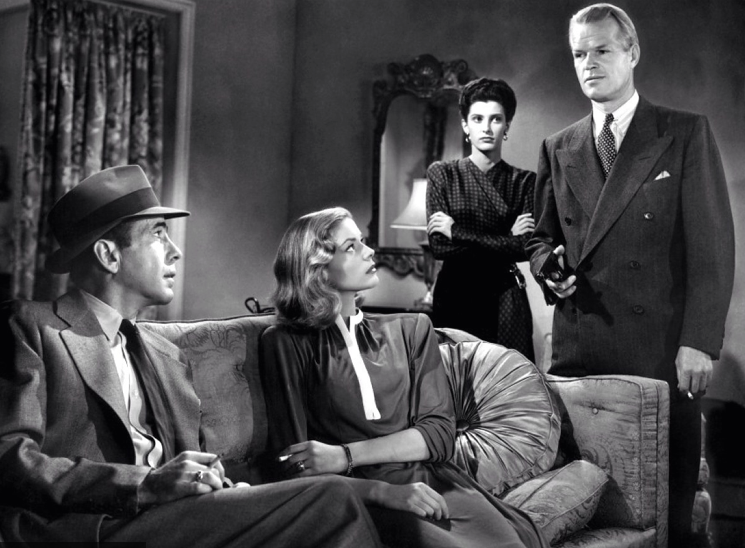 (From left to right) Humphrey Bogart and Lauren Bacall with Sonia Darrin as Anges Lowzier and Jean Heydt as Joe Brody. On the subject of Bogart and Bacall, The Big Sleep oozes plenty of sexual tensions and chemistry. A lot like in their screen debut together in To Have and Have Not, real life lovebirds Bogart and Bacall steam up the screen in The Big Sleep with their quick wit and catchy banter and plenty of sexual innuendo. The one scene that instantly come to mind when I think of their onscreen chemistry is the infamous nightclub scene with suggestive innuendo filled dialogue about horse-racing and riding saddles of all things. In the scenes where Bogart and Bacall are not together, Bogart in particular is in his element sharing screen time with a host of colourful characters, both crooks and mysterious women. Notables performances worthy of a mention include John Ridley as Eddie Mars, the shady big-shot casino owner, Louis Jean Heydt as Joe Brody, the dumb scheming blackmailer who meets his match in Marlowe (Bogart); Tom Rafferty as Carol Lundgren, another petty swindler turned assassin and Sonia Darrin as Anges Lowzier, the female fatale who seemingly always comes up short with a raw deal. But lets not forget also the sensational cameos from Joy Barlow, as the female cabbie who propositons Bogie and Dorothy Narlone, who plays the ACME bookshop clerk, who seduces Bogart during a rainstorm. When I think of Bogart and his career, his role as Philip Marlowe, the LA private eye hired by an ailing rich widower (General Sternwood played by Charles Waldon), to deal with a swindler trying to blackmail his younger daughter Carmen, is without a doubt one of his greatest performances. Equally impressive is Lauren Bacall, but it seemingly took several reshoots and additional scenes to make her shine. Interestingly, out of all the performance that I really like in the film besides Bogart’s Marlowe, it is Martha Vicker as Carmen Sternwood, the promiscuous troubled younger sister of Lauren Bacall’s character. Interestingly, so good was her performance that Warner Bros. actually worried she would upstage Bacall. From what I’ve read over the years, the Bacall reshoots were apparently a direct response to counter Vicker’s performance and make Bacall the true star. But really was there ever any doubt that this picture wasn’t going to be a Bogart/Bacall vehicle? There is so much more that we could talk about The Big Sleep, such as the subtext of the film and its engaging dialogue, and the decadence of Los Angeles of the 1940’s that the film takes aim at, though I think we will leave it at that. But before I sign out, if you haven’t seen The Big Sleep, please do yourself a favour and check it out at least once to see what all the fuss is about! Photo credit: The header image of Humphrey Bogart and Lauren Bacall is a scene from the film The Big Sleep (1946). It is presumably in the public domain. The second image used is also courtesy of Warner Bros. Pictures. I make use of this image under the rational of fair use. It enables me to makes an important contribution to the readers understanding of the article, which could not practically be communicated by words alone by placing many of the key characters of the film into the frame. I am not the uploader of the YouTube clip embedded here.